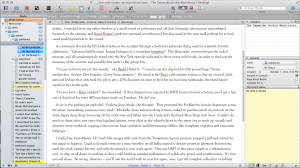 I switched to using Scrivener as my full-time writing tool last year, and still love it. I always had a lot of trouble coming up with a good way to seamlessly manage a bunch of little chunks of writing, and now I have a perfect way to do that. And it’s not trapped in a weird proprietary format; I can easily export it into different forms. Since last April, I’ve used it to put out two books (Fistful of Pizza and The Earworm Inception) and re-release Rumored to Exist as a Kindle book. I’ve also been using it for other ongoing projects, and have been pulling in all of my old books and writing, with eventual hope of either rereleasing them or cannibalizing them for parts. One thing about Scrivener is that a program this feature-rich is going to either have a huge learning curve, or a lot of features you’ll never figure out, or both. And while Scrivener comes with a huge 446-page manual, I’m often googling away to find the solution to some issue. So here are a few things that I’ve found that were not amazingly clear in the docs. Part of my reason for posting these is to help out other Scriveners, but I’d be lying if I didn’t say that I just posted this crap here so I’ll remember it six months from now after I’ve forgotten it, because apparently now that I’m on the north side of the 40 year mark (and I’ve spent a lifetime drinking out of aluminum cans), that happens. Every word processor has its own little shorthand to enter stuff like returns and tabs and other invisible characters into the find and replace dialog boxes. And Scrivener doesn’t use the typical ^t or \t. Instead, when you’re doing a find or replace, hold down the Option key and type your special character. (Your Option key is also known as the Alt, depending on your hardware and key setup. No idea what it should be on a PC.) The characters are not shown in the dialog box, but you’ll know you entered them because the little X to clear a field will be visible, showing you’ve got some text in the blank. If you’ve imported or pasted a bunch of text that was originally a text file, it may have a hard return at the end of every line, like around the 70 to 80 character mark. The way to drive yourself insane fixing that is to move to the end of each line, hit the delete key, enter a space if needed, move down a line, repeat 9374 times. Don’t do that. Open a find/replace, and put an Option-Enter in the find box, and a space in the replace box. You might first have to search for each double enter and replace them with qqqqqqqq, then replace the single enters with spaces and the qqqqqqqqs with enters. Same for enters followed by tabs. If you do the above, you’re left with an uneditable page that can’t be put in your manuscript. To edit it and move it to the manuscript, do a Documents > Convert > Web Page to Text. It can’t be undone, and you’ll lose some formatting, but it will become a fully editable text document. Composition mode. You know that wave of full-screen, no-distraction writing programs? No need to buy anything else; just do a Command-Shift-F. I bump up the width and font, and have a nice picture of Venice Beach in the background, but do whatever brings you to your happy place where you can write. Typewriter Scrolling lets you change scrolling so your current line is in the middle of the screen, which works great in Composition mode. Unfortunately, if you set this by using the menu option of Format > Options > Typewriter Scrolling and you’re not in Composition mode, it doesn’t work. And if you’re in Composition mode… you can’t see the menus. Solution? Do a Command-Shift-T when you’re in Composition mode, and it’ll toggle this on. Labels are neat, but I find the default settings useless. (They’re stuff like “chapter” and “scene”, but those are things I group with folders and documents, so who cares.) Status is also neat, but there’s not an easy way to see status in the project binder. So I edit the labels and change them to stuff like “Needs work”, “eh”, “golden”, “fucked”, and so on. Then I go to View > Use Label Color In and pick Binder. Then all of these status colors are shown in the binder, and I can easily find what needs work. This isn’t a Scrivener tip, but it is an iPad tip that helps when you’re releasing on Kindle. If you need to see what your mobi file looks like in the iPad Kindle app, go to iTunes, click on your iPad, go to Apps, and scroll down to the File Sharing heading. Click on the Kindle app, and click Add, and you can copy your mobi file to the Kindle app and proof away on the device without sending anything to the KDP store. If you don’t have it, get Growl and configure it to your liking. It’s a universal notification system that a lot of different apps can use to send status updates in little popup alerts on your screen, sort of like how Outlook tells you about new mail messages. You can turn on Growl support in Scrivener and it will open a popup when you’re saving or when you hit your target count. Also, Growl may prevent you from going to your mail program every damn time you get a new email, if you get a popup and can see it’s only junk mail and you don’t need to stop writing. And a Growl hint: if you get a ton of popups, Option-click one and they will all vanish. I use a Scrivener project called “plotomatic” as a catch-all for all of my notes, unexplored ideas, and leftovers. It’s much easier than having a scattering of notes in ten different places, and it’s easily searchable. Think about an easy way to do something similar, to limit the amount of searching you have to do for old stuff. Hope this helps. Happy Scrivening, and please get in touch with any of your favorite tips! This entry was posted in Uncategorized and tagged scrivener by jkonrath. Bookmark the permalink.